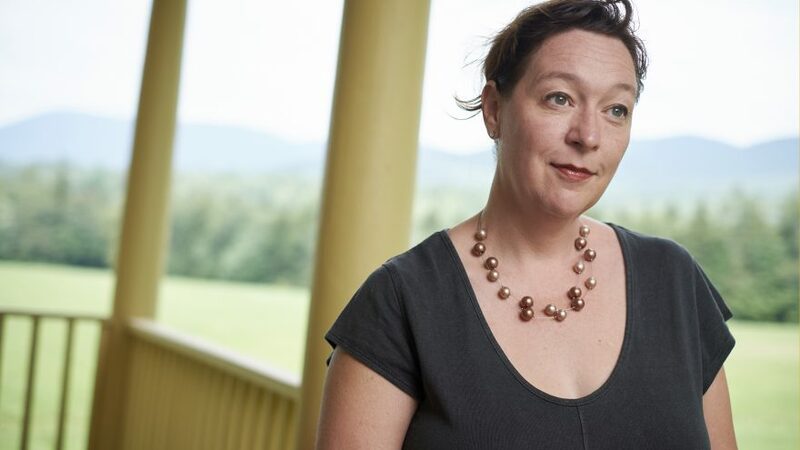 An acclaimed poet, professor, and translator, Jennifer Grotz has just concluded her first year as director of the Bread Loaf Writers’ Conferences. Middlebury Magazine caught up with her earlier this fall to chat about her first year on the job. I know you’re no stranger to the Writers’ Conference, having made the trek up the mountain for many summers since 1995, but this was your first year as director. What was the most surprising change? The most surprising change this summer (weirdly, because it was somewhat my own doing) was just all the new faces on the mountain. We had a lot of new faculty this summer, and Bread Loaf continues to be a truly diverse—in every sense of the word—group of writers. And what was blessedly the same? I’d like to stay with this notion of a new faculty bringing added diversity and fresh thinking to a storied program. Threading that needle isn’t easy and could have backfired if the collaboration hadn’t happened. Why do you think it worked so well? You know, I think it worked well for two reasons. One is that some of the new faculty were new as faculty members but weren’t necessarily new to Bread Loaf. They knew the place, the magic of the place, and the potential it has, and they wanted to return to it and also to share it with other new faces. This is one of the things I love most about Bread Loaf—how at its best it works as a kind of ecosystem, for lack of a better term, that includes writers at every stage of the writing life or career—and how writers at all different stages are there modeling for each other all the various possibilities of a writing life. And what the writing life looks like over the long haul: several of the folks serving on faculty for the first time were actually former “waiter” work-scholars or fellows or even former contributors, so there was this sense of joy of returning to the conference now on faculty. And the other reason I think the new faculty worked so well together was that I tried to do something that the former director, Michael Collier, also did: that is, to look hard for amazing writers who were also gifted teachers. It’s that combination that goes a long way toward helping to forge a really positive and productive community. You are just the seventh director in the conference’s history—and the first woman to hold the job. What does this milestone mean for Bread Loaf? I’ll confess that there is a little part of me that wants to downplay the significance that I’m a woman, the first woman to direct the conferences. I think that comes from wanting acknowledgment that my skills and experience play the most significant part in my being appointed, on the one hand, and also my hope that our country might be a little more advanced in terms of equality than it is. But of course it is hugely significant, now more than ever, that the Writers’ Conferences has its first woman director—and I’m proud to be that person. It represents an important milestone, as you say; it also enacts a kind of following through that it’s important for institutions to do. I mean, it’s one thing to state a commitment to diversity, inclusion, equality, which many institutions are doing, but the next step is to enact that commitment in the community—and leadership—of the institution. Well, it’s a joy. It feels like a rare privilege to be given an opportunity, a position, that calls upon—and makes use of—all the experience and skill I’ve gained as a writer, teacher, and arts administrator over the past two decades. So in that way, it feels like a culmination of some kind.